Sunflowers to me represent a burst of sunshine. This pastel drawing of a sunflower shows that burst of life. 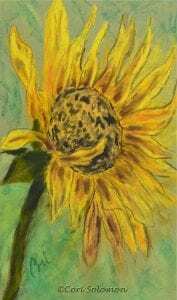 Created from a photo taken by friend Tenley Fohl, whose fabulous photography is giving me the inspiration to capture the beauty of nature especially flowers, a newer subject matter for me. This floral artwork come matted and framed.